Pitch invasion by their fans . Burnley are recording their first away win in ages. I'm sure there will or should be repercussions about lack of security etc from FA. Also Ian wrights comments on full time score oh how very true. Posted on here ages ago that they have s*** owners and to have someone like Karen Brady running the club is hilarious. I lost any respect i had for whu when i heard the deal brady wangled. £2.5 m rent per year, and they dont have to pay for police presence during their games, stewarding,heating,pitch maintenance or corner flags.................! absolute joke. We pay wembley £15 mill for a season and that is more realistic. It is ridiculous, I also believe they can't use the stewards and security they want. The government did not want a white elephant and the owners wanted to make money , not that I could care less but its no surprise the fans are the ones who are s*** on for everyone else to prosper. Very thin ice if you don't actually own your ground. sad to see scenes llike this again, they deserve all they get, and i hope they get plenty thrown at them. Looking at sky news it seems the fans are not happy at all with a number of things, one being at the os and didnt want to leave the boleyn ground in the first place. Hardly any money spent on players in 2 windows. Too far away due to the running track. The protest was against the owners. If they are so unhappy you would have thought the easier thing would be to stop supporting by staying away /dont buy season tickets/shirts etc. I think with all what is going on there that they will be lucky to stay up. 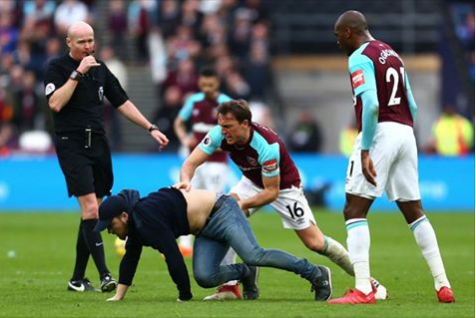 West Ham have apparently asked that they become responsible for security and stewarding at the stadium. Would they be be prepared to pay for it Themselves? This club and its owners are a joke and a disgrace. Extra security vs southampton to cost the tax payer £60,000. London mayor Sadiq Khan has asked them for a contribution ? A billionaire owned club and the tax payer picks up a proportion of their running costs. Total shambles renting out the OS to them. At least Sadiq is blowing the lid off the corrupt deal that Boris did. He might be a Liverpool fan which is a disgrace for a London mayor but he's making sure the wider public know what a travesty the OS funding is. So much for the spams big spending ambitions under pellgrini ! Ryan Fredericks (ex spur by the way) signed on a free from fulham. Without checking wasnt he rated a big prospect once at spurs but injuries got in his way ? Maybe this is one that will come back and haunt us and spams will love it if they get one over on us with him. My point though tom is pellegrini is already upset with the owners not sticking to their promise of big money signings and they start with a free signing....? I doubt Pellegrini wants to spend money for the sake of it so if he rates Fredericks I don't see the fact that he was free annoying him... but it's great to know there's already trouble in paradise between him and the owners if the press have it right! Hopefully he'll quit and they'll bring in someone who gets them relegated. 2nd free signing coming in yaya toure ! again. Doubt he'll complain about signing Yaya. I wouldn't have and we're a bigger better club. Yep ! we arent anywhere to be seen right now in any transfer business that is for certain. Going to be another mediocre window.